BIG CHANCE. Glider Pilot gets on well with jockey Craig Zackey and is the runner to beat in Race 8 at Turffontein tomorrow. Glider Pilot did not have the best of luck in last Sunday’s Grade 3 Jubilee Handicap over 1800m. However, with a better draw and the conditions in his favour, Tyrone Zackey’s charge can get back on a winning track tomorrow when he contests a Graduation Plate over 1600m on the Inside track at Turffontein. Glider Pilot has won twice and placed four times from nine starts but disappointed when ending up in 10th place out of 13 runners in the Grade 1 Premier’s Champion Challenge behind Coral Fever and again last week when eighth in the Jubilee Handicap. One could find excuses in both events as he was badly handicapped in the weight-for-age Champions Challenge and drawn widest of the 13 runners in the Jubilee Handicap. He has raced once on the Inside track and on that occasion, over 1600m, he looked all over a winner when hitting the front close home only to be run out of it by Matador Man. Craig Zackey has a good record on this four-year-old son of AP Arrow and is back in the irons on this occasion. Glider Pilot will also be racing in blinkers for the first time so it will be interesting to see if that results in any improvement. Royal Crusade is from the Mike de Kock yard and is the third best handicapped runner. This son of Silvano contested all three legs of the Triple Crown, finishing third behind Monks Hood in the Gauteng Guineas, ninth in the SA Classic and fifth in the SA Derby. He was gelded a few days after the Derby, something which De Kock felt was much needed. We should see some improvement from him but this will be his first run on the Inside track and this course might not be ideal for him. Having said that, he has a decent record over 1600m and will have the services of Callan Murray. 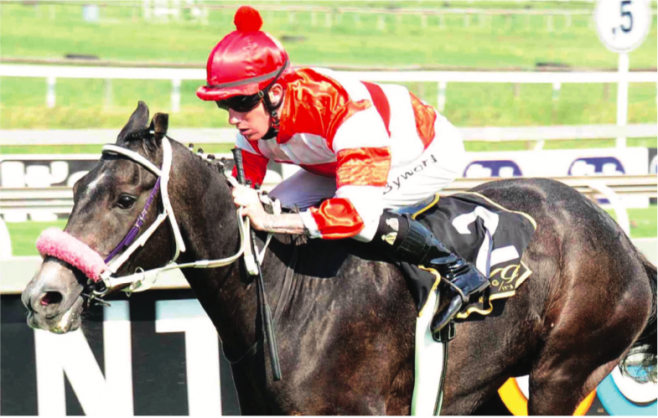 Five-year-old Juan Two Three, out of the stable of champion trainer Alan Greeff, looks on his way to a 10th career win on the Fairview Polytrack today when teamed up Greg Cheyne in Race 6 and main event, a Pinnacle Stakes over 1200m, writes Viv Greybe. This son of Var has not been out of the money on the Polytrack in five starts, three of which were wins. Cheyne was aboard in the ace sprinter’s last three outings when carrying big weights in feature events – finishing a 0.50-length second on the Polytrack and then a head second on grass.